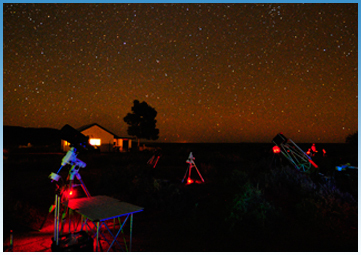 What started out as a casual idea by Pre­toria Centre members, Johan Smit and Danie Barnardo to invite some friends along to share a wonderful experience under the dark Karoo skies, ended up as South Africa’s first National Star Party. 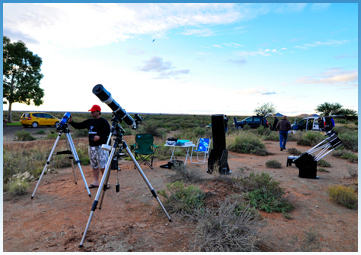 It was attended by 38 people representing a slice of the stargazing community of South Africa. The gathering was held dur­ing the long weekend 25 to 27 April 2009 at the Kambro guest farm, 20 km north of Britstown. The town is centrally located, 250 km south of Kimberley on the N12, on route between Cape Town and Johan­nesburg. Danie regularly sleeps over at Kambro and on returning to Pretoria is always haunted by the memory of the pristine skies of Britstown. 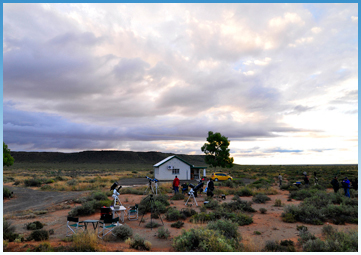 The idea of a bigger event grew after he and Johan subsequently decided to spend a weekend there doing telescope viewing and enjoy­ing Karoo lamb. Serena reiterated Danie’s experience: “The sweeping Karoo plain, fringed with rolling hills provided open horizons and spectacu­lar vistas. 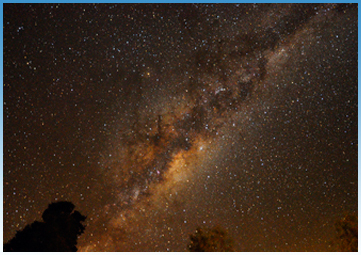 The Milky Way was draped over the sky like threads of silk, studded with diamonds. Even experienced stargazers who had seen it all before were heard to exclaim in wonder. One can only hope that this may become an annual event. Instead of just sliding by the seat of one’s pants, with a bit more structure, perhaps more opportunities for folks to mingle and meet and a possible plan B for in case of really fowl weather, this gathering has the potential to become South Africa’s Stellafane. Johan Smit al­ready promised: “We are thinking about making this a regular event. Next time the arrangements will be more elegant and the marketing better.